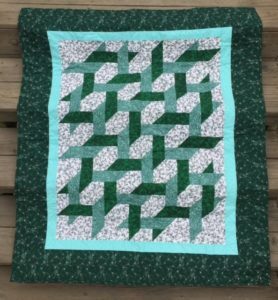 I didn’t meet quilter Eileen Melia until after friend and support group co-facilitator Toni Marshall and I had been taking traditional medicine for a year, after we had been actively practicing gratitude for longer. An attitude of gratitude as medicine led us to a new practitioner with ancient, more successful treatment than what we had already tried. The customized herbal formulas from the Vietnam trained acupuncturist now at The Gilbert Clinic strengthened us, stabilized us enough to start a sister support group, one for officially practicing gratitude in a group intent on healing. That turn of events brought Eileen to us, presumably as life was preparing her to meet us, and we all started exchanging our gifts. 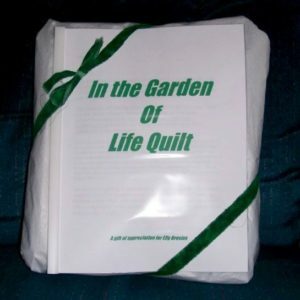 The surprise package of the In The Garden Of Life affirmation quilt by Eileen Melia. The affirmation quilt built for me, In the Garden of Life , arrived at my Virginia home in March 2013. Eileen tried to make a quilt for me sooner, before Toni’s Serendipitous Graces emerged, but the timing worked out according to its own sacred schedule. Now three years after I have received it, my quilt is still on my mind and has a hold on my heart. The sowed sewn seeds grew and bloomed into this series of blogs on her Affirmation Quilt Ministry as the thank you note and love you letter I haven’t been able to write until now. Like the curling, curving parallel ribbons in my quilt, Eileen and I are on curvy parallel paths providing others with opportunities to see more holy in the mundane, to see some ethereal in the material. She sows seeing appreciation with her stitches and meditations, and she shines her enthusiasm and light on how to see more than the seams. My online writing group and my conference calls for gratitude are for fortifying one another’s faith that there is more than what seems at every twist and turn. The Celtic Ribbons pattern Eileen chose for me with all those intersections suits my focus on the intersections of stories. 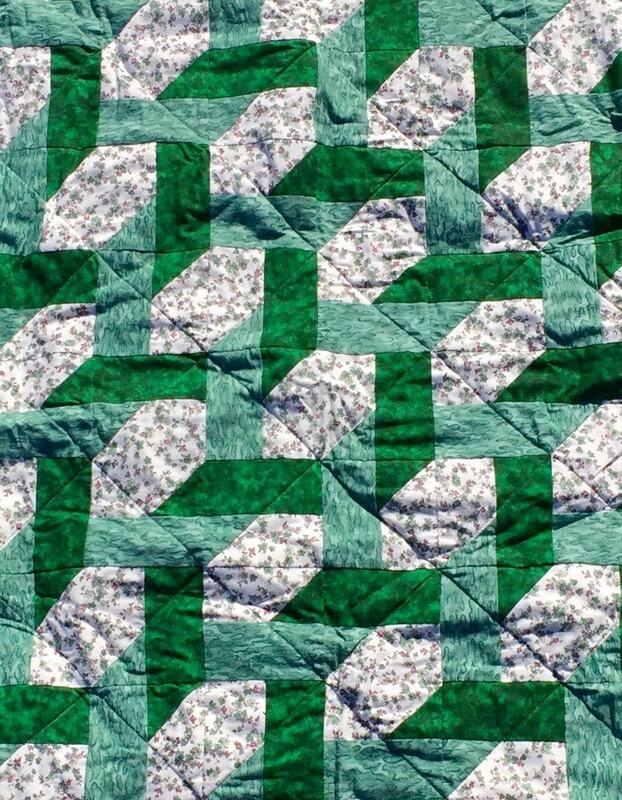 The corners where the light green ribbons meet the dark green ribbons remind me of partners, square dancing elbow in elbow, swinging on home together. Writing is something Eileen and I both do because we feel compelled to write about certain subjects at certain times. We both have shared long and short pieces people save for years and quote back to us. In the ribbons of this quilt that connects us, I visualize yards and yards of typewriter ribbons keeping impressions of the letters we shared. 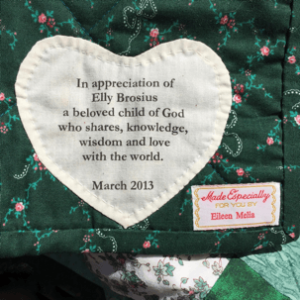 “As the final stitches of this binding were hand sewn they became a prayer for you, Elly, that the God of all love, the God of all hope, and the God of all peace be a constant well source of abundant blessings as the journey continues. God blessed, machine washable, and dryer safe, a holy trinity! The invisible layer of sacred batting can take the floods and it can take the heat; this quilt can protect the threads of my being. Ideas about bindings, being bound, covers and recovering are sprouting in my mind now. Eileen’s quilt bindings have invisible, hand sewn, loving and prayerful stitches and seeds and her precious printed words are protected and bound with clear report covers and brightly colored binding bars. The quilted bed or lap cover and report package bind Eileen to a recipient in story even as she offers complete freedom, the gift of no strings attached. Opening the clear covers to read and reread the words and getting under the covers of an affirmation quilt can lead to recovering of energy one didn’t know was lost. We often have met folks when they are in a bind health wise and needing new help, Eileen through her nursing and various volunteering and me at the ME/CFS and Orthostatic Intolerance (OI) support groups. We continue this journey bound together now, and homeward bound. Not washed yet, my quilt stays safely away from dust and a dog with must-destroy-fabric-and-fiberfill tendencies. Maybe I also hid it because its vast love and meanings have been too much to encounter in my everyday up until now. I visit with it on occasion. I take it out for photo sessions in different kinds of light. I spend time pondering the photos searching for patterns In the Garden of Life for visual clues to my wordy journey. 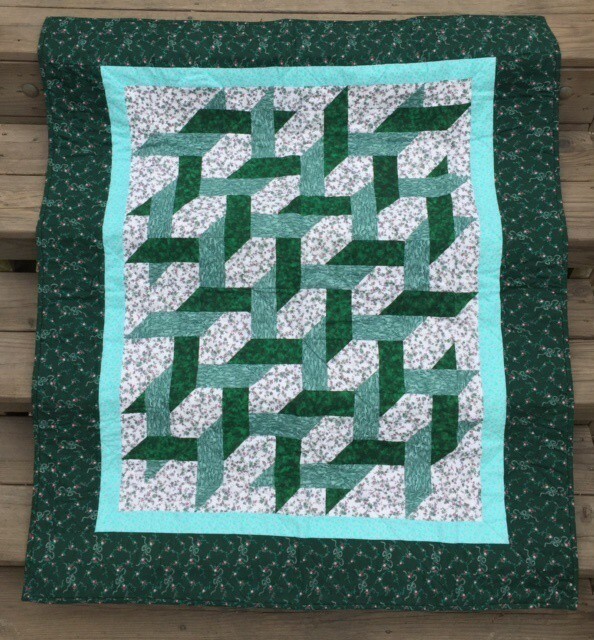 The intricate quilt style is known by many names, Celtic Ribbons, Scrap Ribbons, Loose Ends. Curiously, searching images on the web I could only find one other that was of the same pattern. I am growing into being comforted continuously by my nearly unique and complicated quilt, its personal meanings and universal messages. I am tying up my inner life’s loose ends for experiencing more wholeness and holiness. My favorite whole quilt photos are the ones included here on stairs. The way the ribbons move also look like stairs to me and speak to me of the ascending and descending that happens, sometimes daily, on the journey. I did and I do. And I am glad we got good and specific about which greens were my favorites. Forest green tops my list. Restful, for rest, forest green. 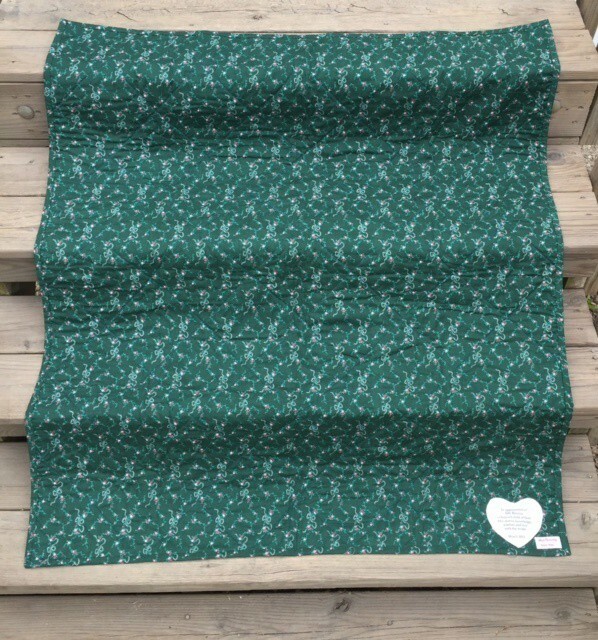 While I enjoy the fluorescent lime green fabric that starred in Toni Marshall’s beautiful Serendipitous Graces quilt, I might find that green too bold for rest. Toni talks often of experiencing happiness now she never knew earlier in life. Lime’s boldness and association with happiness symbolism suits her. 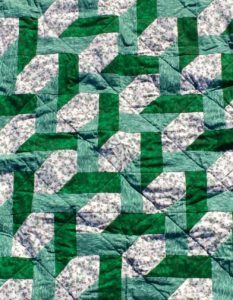 The variety of greens in my quilt suit me for rest, minty freshness, and hints of sage. In The Garden Of Life signature heart. When first received, I couldn’t yet see the quilt’s beauty as a whole work. I couldn’t hear all The Meditation was saying. It was too much to take in. I was too close. I was still too closed off. In my first few photo sessions with the quilt, images came out with dim lighting and with unpleasing angles. I knew it to be a masterpiece of love, gratitude, and meaning, but I couldn’t yet picture all the ways. Now I can see it, write of it, picture it. Before the light turns green to go to what’s next, to see more close ups and read the full Meditation for Elly Brosius, In the Garden of Life Quilt , there is a bit more beating about the bush I will do. I need to point out something about that bright and dark mottled green fabric of the dark green ribbons. Unbeknownst to Eileen, I had a stash of that fabric. I love that pattern and color! I am sure I either bought it on more than one occasion, or wanted to. All I probably could manage to do with it was drape it on household clutter to hide the mess. I couldn’t, still can’t sit long enough to sew much. When sitting up straight, I can get to feeling awful and can’t sew in straight lines. Trying to sit up sometimes invites my struggling circulation to turn my skin a mottled dusky purple. 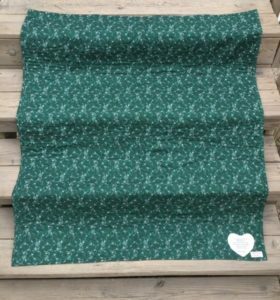 The dusky mottled favorite green fabric will forever be a reminder not to push myself to the point of being noticeably mottled myself. By the time one’s skin gets mottled, by the time one is looking blue, there is some crisis within to listen to and treat with rest or something else. Fine pink flowers are featured in not one, not two, but three fabrics chosen for my affirmation quilt including the most used background and border material. Pink is budding almost everywhere. Love that after all the years playing the blues and literally looking a little blue. By respecting my limits, listening within and honoring what I hear, surrounding myself in colors for rest and rejuvenation, using unusual forms of medicine, I am rewarded with pink buds and feeling a little in the pink. Many thanks to Eileen R. Melia for effectively ministering to me and so many others with her affirmation quilts and meditations; for granting permission to share our intersecting stories; for supplying quotes full of her characteristic enthusiasm, validating insights, and encouragement; and for finding and sending historical photos full of color, pattern, and metaphor. Being gifted In the Garden of Life and getting to write about it with loving hands of sisterly support assisting behind the scenes has been a blessing received for empowering a calmer heart rhythm for me. With the graces of synchronicity, healing energy of love, and nurturing mother energy, I have more experience of the capital lettered word PEACE Eileen has sewn onto the back of countless world map quilt offerings to laureates, spiritual leaders, educators, and poets. Eileen excitedly and continuously affirms the constructive works of others. May my words affirm her inspired ministry. ©Elly Brosius, 2016. All rights reserved. Excerpting is allowed with credit and direction to original content. For full reprint permission, contact@intersectingstories.com. Photos by Eileen Melia and Elly Brosius. Content @Elly Brosius, 2015-2016, unless otherwise noted. Website's parent theme is twentyfifteen by WordPress.